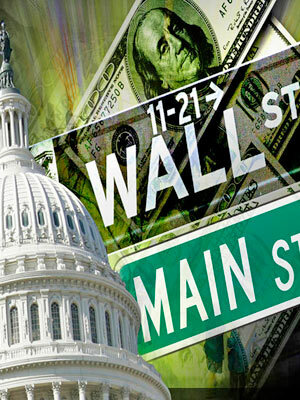 What Does the Wall Street Bail-out Mean For You*? * By “you”, of course, I mean “me” – unless you’re also a Beverly Hills real estate investor and flip-artist. October 3 2008 Excuse me for not posting for a couple weeks, but I’ve been glued to every and any news source I can find to follow the meltdown of our financial system – and staving off my own emotional meltdown in the process. Regardless of your politics, there’s plenty of blame to be shared across both sides of the aisle and this has been a long-time coming. Like many of us, I’ve been hearing dire warnings from friends on Wall Street for over a year and dismissed them as kill-joy doomsayers like the crazy guy on the street-corner with the “The End Is Nigh” sign. Let’s just hope he’s not right, too. The silver lining to this gloomy black thunderhead of a cloud is that this could usher in a whole new era of better government, better oversight, stronger regulation and a newer, stronger, more vibrant and sound economy that opens new opportunities for all of us. Or not. We’ll start to find out a month from now. Preparation plus opportunity equals success. It’s an old saying with many taking credit for it but it’s true and timely. Every change – no matter how painful – brings opportunity for those who are able to identify it and adapt to take advantage of it. The real estate business will fundamentally change. “Flipping” houses may or may not be a viable strategy at least for the near future but plenty of opportunities will exist – some we may not even have thought of yet. The bright spot in the otherwise dreary real estate market up to now has been the high-end. As the American middle-class weakens, the world’s rich have been getting richer as evidenced by the over-the-top demand for ultra-luxury goods including million-dollar cars and diamond-encrusted human skulls. The very top-end of the real estate market in the select areas of Beverly Hills, Bel Air and Malibu (“Bevairbu”) has remained strong with a few clever realtors having their strongest years ever. Houses in $10 to $30 million range in Bevairbu have been selling briskly to all-cash buyers. When you’re not applying for a loan, you don’t care about mortgage rates. And you can rationalize paying prices above appraisal values. This explains the McCourt’s $19 million purchase of a crumbling beach shack on Malibu’s Carbon Beach next door to the Lautner-designed house they bought for over $33 million. The number of sales of homes over $15 million in Beverly Hills and Bel Air increased over the last 12 months (ending October 1 2008) to a five-year high with more sales than ever getting near or above asking price in fewer than 70 days on market. Remarkable, given what’s been going on everywhere else. And positive sales trends in Beverly Hills is reported in a separate posting here. Is that party over? Too soon to tell for sure. The world’s super-rich may be too insulated to be affected. Most of these buyers are foreigners – Russian oligarchs, Middle Eastern oil barons or members of exiled political regimes. They may be drawn more than ever to the relatively stable market of Los Angeles’ Westside in an increasingly unstable world. My advice for the near term is to move into rental properties, building a portfolio of small homes in solid middle-class neighborhoods with a minimum of a five-year time horizon while keeping an eye on the sales activity in the usually recession-proof Bevairbu. Check back in a few months to see how my advice holds. Amid the Chaos, Is This Any Time to Invest in Real Estate? September 21 2008 Bear Stearns! Goldman Sachs! Lehman Brothers! AIG! Fannie Mae! Freddie Mac! Wall Street bail-outs! Every day a new sensational headline about the meltdown on Wall Street. Just when we think it can’t get any worse, it does. So what, exactly, does this mean for real estate investors and is this any time to get into – or out of – the market? That’s right. Repeat it a few times. Write it down, if necessary, so you don’t forget it. All you have to do is invest when prices are low and sell when they’re high! That’s all there is to it! It’s that simple. The only thing you have to figure out is when the prices are low and when they are high. When you figure that out, let me know. I can’t tell you when prices are going to be high but I can tell you one thing, they’re low right now. They might even get a little lower – but the fact of the matter is, they’re pretty darn low today. And I can tell you one other thing – they will rise. I can’t tell you exactly when, but I’m pretty sure that within five years they will have at least recovered to their pre-crash levels if not more. Without getting into the detail of it, real estate has, historically, consistently delivered some of the highest returns on investment over time. Sure, there are ups and downs along the way and speculators have been known to get reckless and homeowners have suffered. But those losses almost always occur when there’s a short-term time horizon and homeowners or speculators are banking on short-term gains. Investors who endure and succeed are the ones who are in it for the long term. I learned that lesson the hard way with my first real estate investment. I was looking for a quick buck from flipping a co-op in New York City in the mid 1980s and I lost when conditions in the neighborhood suddenly made it un-sellable. (The city opened three welfare hotels immediately adjacent to the building.) At the time, I felt like the first person ever to lose money in the go-go Manhattan real estate market – but I wasn’t the first, nor the last. Those welfare hotels were gone two years later and the neighborhood quickly gentrified. In fact, one of those “welfare hotels” became one of the first of the new wave of “hip” high-end hotels. If I’d had the wisdom, wherewithal and resources to hold on, my $75,000 investment would have been worth at least $1.5 million today. On top of that, I would have taken in nearly another million dollars in rental income by now. The property would have been fully capitalized (paid for itself) after only seven years with the remaining fifteen years providing pure profit. Even after expenses and taxes, that’s not so bad. My partner in that deal did hold on and that co-op is one of the best performing assets in his investment portfolio today – and he’s a successful hedge fund manager. I predict that five-to-ten years from now, many of the people we read about in the Wall Street Journal and on the Forbes 400 list will have made their fortunes building their real estate portfolios today. Here’s my advice. Buying foreclosures and other well-priced distressed properties and running them as rental properties with a long-term time horizon of five years or more could be a very smart move right now. That’s why I’m talking to my partners about investing our money in residential income properties – maybe even some commercial properties like small retail centers and coin laundries. Stay tuned and I’ll let you know how it goes. And let me know what you’re doing out there. For more information about investing in this tumultuous market, read “What Does the Wall Street Bail-Out Mean For You?” And look for future postings here about how to find and buy foreclosed properties, evaluate a real estate investment including calculating the capitalization rate and rate of return.